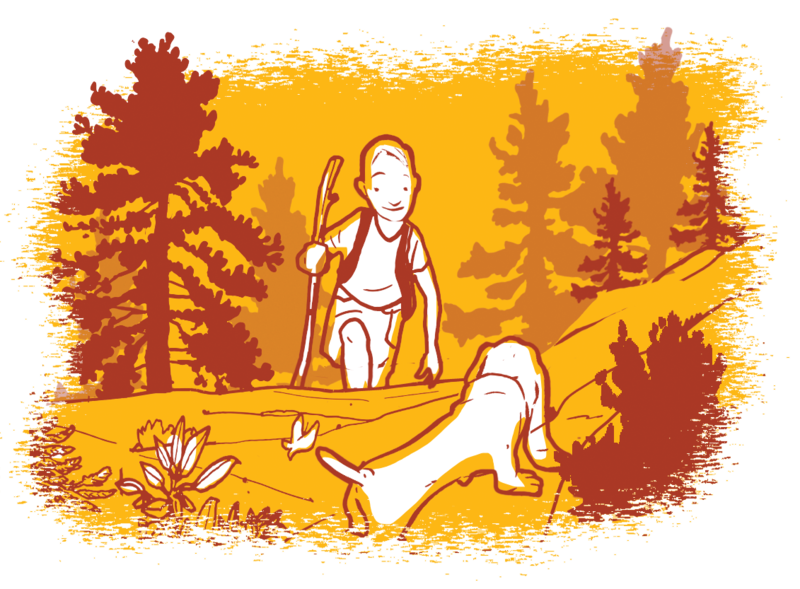 emember when you were a kid and the natural world was one enormous adventure? It was something to be explored wide-eyed and with both feet forward, a place where the unmarked paths begged to be taken. Cloud formations and towering trees put your very person in perspective, and a rope swing beat a diving board any day of the week. That’s what fall excursions should be. Whether your journeys are bucket list material or just an excuse to flee Wi-Fi for a weekend, we think you should spend the days of dwindling sunlight with childlike enthusiasm. Just do like the trees do this time of year: Make a full-bore, end-of-season, what-the-hell splash. Pretend you’re Tarzan while clutching a zip line, or float like The Wizard of Oz in a hot-air balloon. 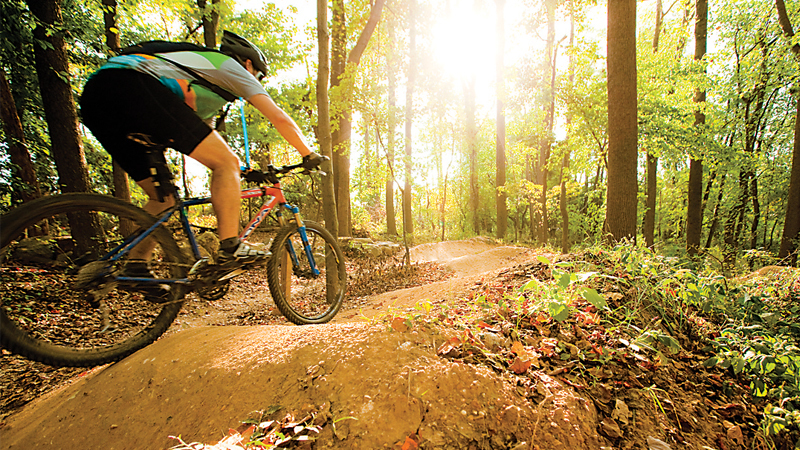 Pedal a rail-trail through an enchanted forest, or picnic with pals in a centuries-old wood. Even if you barely escape the neighborhood, you owe yourself a fall fling. 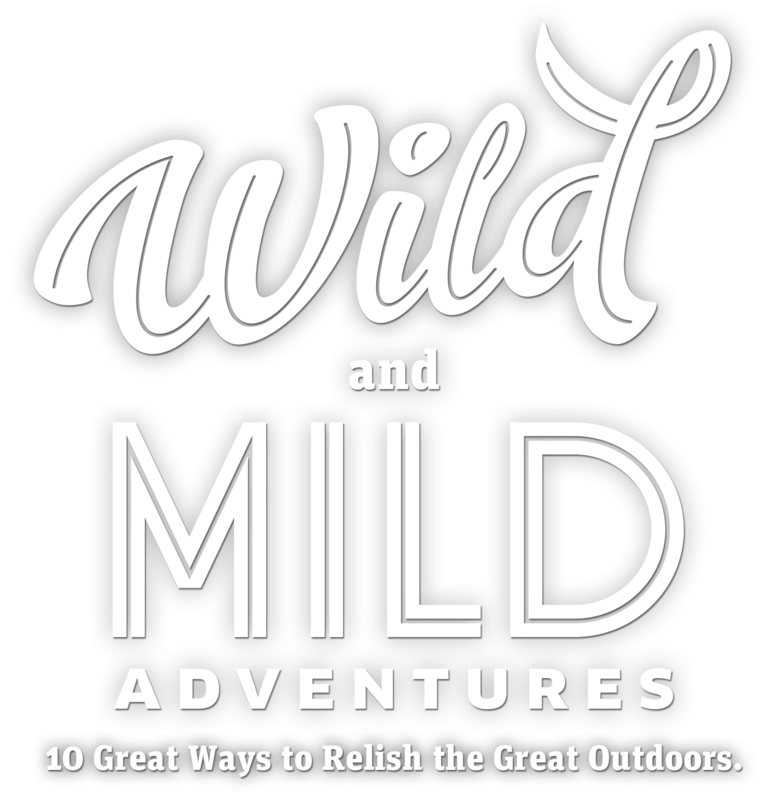 Since not everyone shares the same inclination for torching calories and touting adrenaline, we’ve divided our fall adventures menu into two flavors: wild and mild. And if you have neither time nor disposable dollars enough to indulge in anything too grand, consider our options for localized escapes, too. After all, backyards are the birthplace of natural curiosity. Virginia boasts whitewater where you’d least expect it: downtown Richmond, where the James River tumbles over boulders and broken dams under the capital city skyline. Launch at Pony Pasture Park and paddle to Reedy Creek, a route suitable for even beginner kayakers. The pace quickens at two Class II rapids, Choo Choo, near a soaring railroad bridge, and the rock-strewn Mitchell’s Gut. 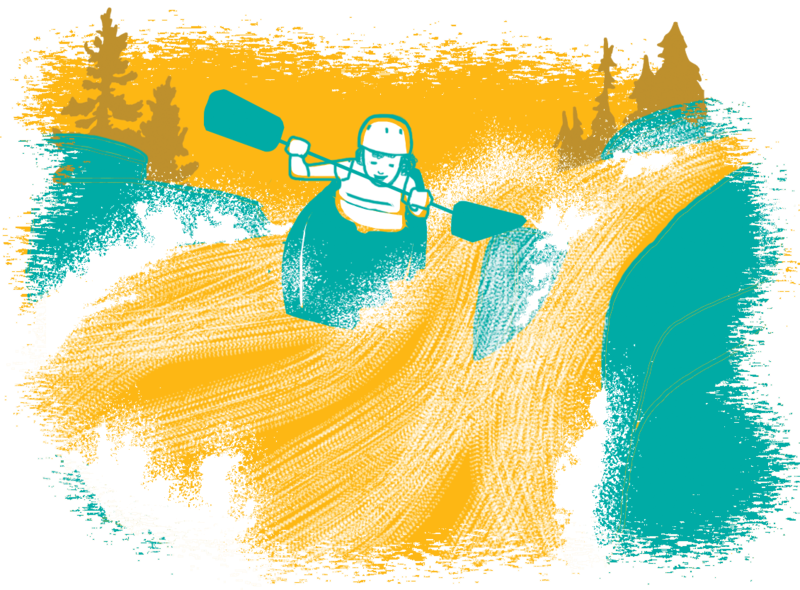 Challenge yourself at the Class III, triple drop Pipeline Rapids. No kayak? RVA Paddlesports offers rentals and on-water instruction. Stay: Salvaged architecture and original artworks grace the Quirk Hotel’s fashionably located lodgings in a former 1916 department store. Don’t miss the Q Rooftop Bar, where mixologists love to craft cocktails for “spirits-ual” holidays including Rum Punch Day (September 20) and Mezcal Day (October 21). Savor: Ensconced in Quirk Hotel’s lobby, Maple & Pine ranks among the city’s top restaurants. Plate sharing is optional; apple crisp with cheddar ice cream, if it’s available, is not. Also slurp roasted oysters and watch the river from the prow-like deck at The Boathouse at Rocketts Landing. Closer to Home: Class II and III whitewater flows as close as the Gunpowder River below Prettyboy Reservoir in the Hereford Area of Parkton. Looking for some more wild waves to conquer? On your way back to Baltimore from Richmond, take a 15-minute detour outside of the nation’s capital to Great Falls Park on the border of Maryland and Virginia. Here, the Potomac River cascades into a natural wonder, building in speed and force around a series of rocky surfaces and the narrow Mather Gorge. Its whitewater offers adventure for everyone from the novice (Class II) to the extremist (Class V+). Watching from the sidelines? There are several waterfalls to ogle at as your friends catapult down the river. 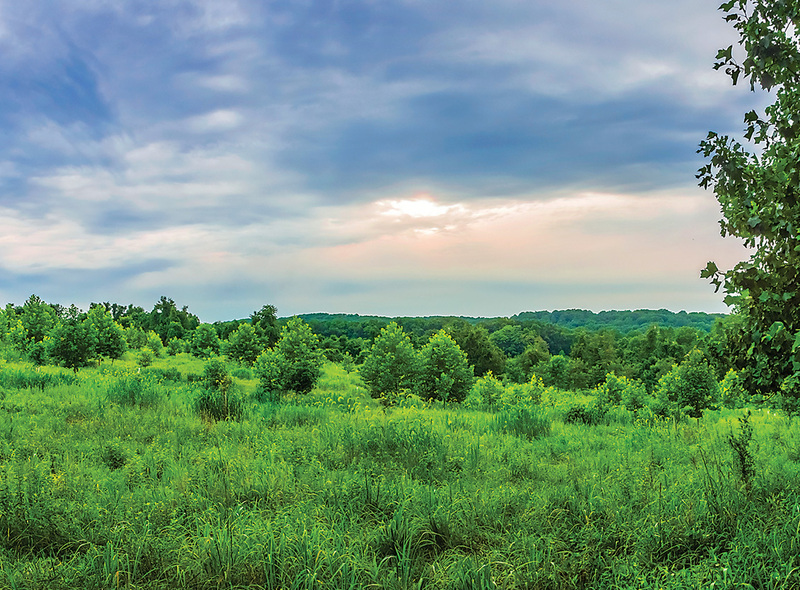 A century ago, West Virginia’s Greenbrier River Valley bustled with train traffic and mill towns to serve the king of local industry: timber. Reclaimed by the very forests that rail and lumber barons once profitably harvested, the valley now boasts one of the East’s most bucolic rail-trails, the Greenbrier River Trail between North Caldwell and Cass. Hearty souls may want to tackle the entire 78-mile gravel path (amenities are limited, so pack accordingly). Alternatively, take the 24-mile northern stretch of this river-hugging route to see boundless wilderness dotted with decaying relics of the old rail line. Stay: Cyclists can find comfort in the trailside campsites and refurbished millworkers’ houses in Cass Scenic Railroad State Park, the trail’s northern terminus. Also stay in the GRT’s largest waypoint, Marlinton, where the Locust Hill inn offers trail trekkers cozy rooms, full complimentary breakfasts, pub fare, and shuttle service. Savor: Sip a craft brew with your breakfast sandwich or luncheon pizza at Dirtbean Cafe & Bike Shop, a colorful eatery that also rents and repairs two-wheelers in Marlinton. Closer to Home: View the small towns and autumn-flecked hills of hunt country on the 20-mile Torrey C. Brown, aka North Central Rail (NCR) Trail from Hunt Valley along the Gunpowder Falls State Park to the Mason-Dixon Line. Call it leaf peeping for speed freaks: swooshing down a forested hillside on a zip line canopy tour is fall’s extreme sport. For a hair-raising endurance ride, make a reservation for the Vertical Trek at Roundtop Mountain Resort in Lewisberry, Pennsylvania, a 10-step, two-plus-hour descent of the ski resort’s mountain. Gliding from one treetop platform to the next, sometimes 40 feet above ground, each rider navigates zip lines as long as 400 feet, tipsy bridges, cliff ledges, and other gulp-worthy challenges. Stay: The historic Allenberry Resort in nearby Boiling Springs has a new look. The 57-acre property has preserved its heritage while updating its lodgings, restaurant, and playhouse along the burbling Yellow Breeches Creek. Book a choice room in the renovated Stone Lodge, originally the barn and stables. Savor: With a fishing stream on the premises, Allenberry’s The Barn Restaurant unsurprisingly highlights local seafood dishes such as pan-seared rainbow trout amandine, while sticky buns remain the treat de la maison. Adventurous activity also begs adventurous eating. Try house-fermented kimchi tacos or kale-pistachio pizza at Little Bird Craft Kitchen in Camp Hill, the innovative eatery of Ever Grain Brewing Company. Closer to Home: Go zip lining, rope-walking, or scale a 43-foot tower and descend headfirst inside the super-skinny “rainbow serpent” net at Terrapin Adventures in Howard County. 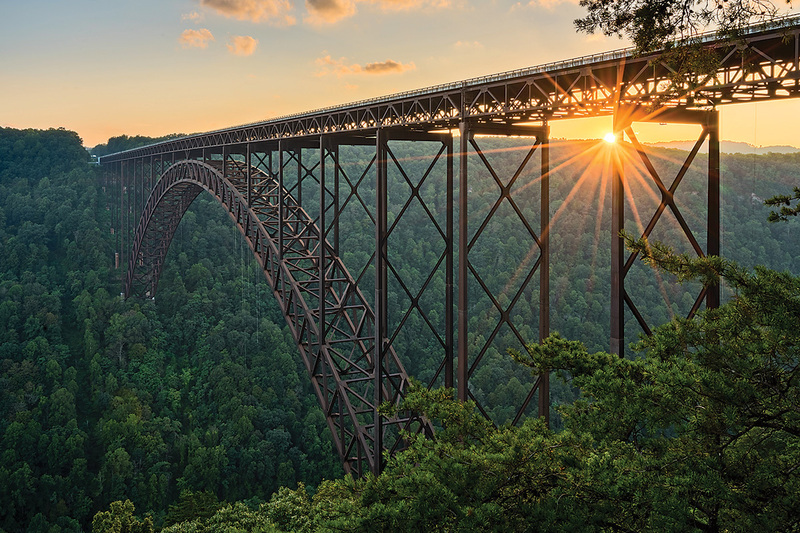 Celebrate the wild and wonderful during Bridge Day, West Virginia’s extreme sports extravaganza on October 20, when parachuted BASE jumpers fling themselves—one every 30 seconds on average—off the impossibly scenic, 876-foot-tall New River Gorge Bridge near Fayetteville. What’s even wilder? This lemming-esque lunacy goes on for six straight hours, while thousands gather to watch. Leave bridge-diving to the pros, but try whitening your knuckles on the Highline, a 700-foot bridge-to-gorge zip line, or shuffling among the span’s support beams on a skinny catwalk overlooking the river’s churning rapids. 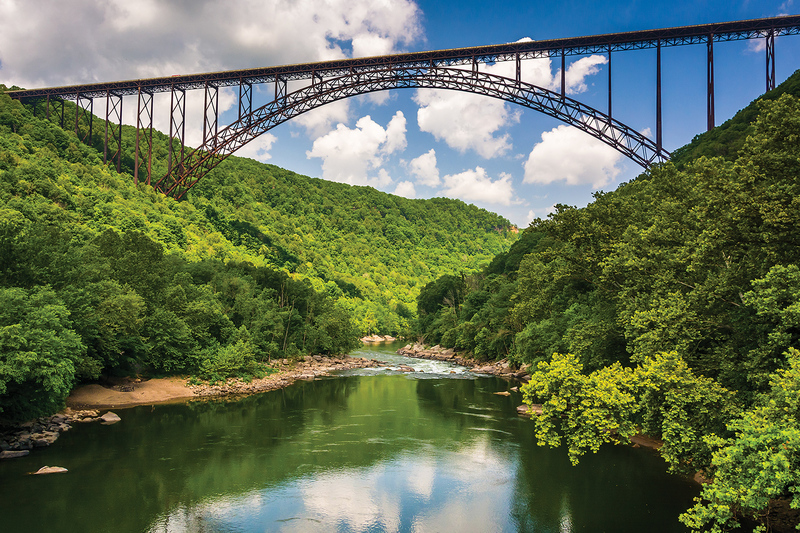 Stay: Known for its whitewater rafting trips, Adventures on the Gorge beckons visiting thrill-seekers to the New River rim. 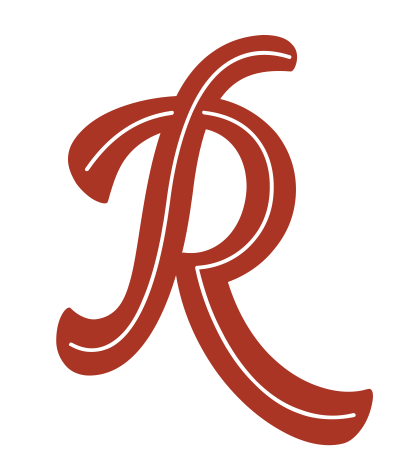 Choose from a range of rentals, including rustic platform tents, one-room log cabins, and deluxe multi-family lodges. Savor: Sample local fare during Taste of Bridge Day on October 19. The Secret Sandwich Society in nearby Fayetteville serves gourmet, presidential-themed sammies. Try the McKinley (spicy meatloaf on crunchy sourdough with chipotle-bacon jam) and a side of ooey-gooey-good pimento cheese fries. 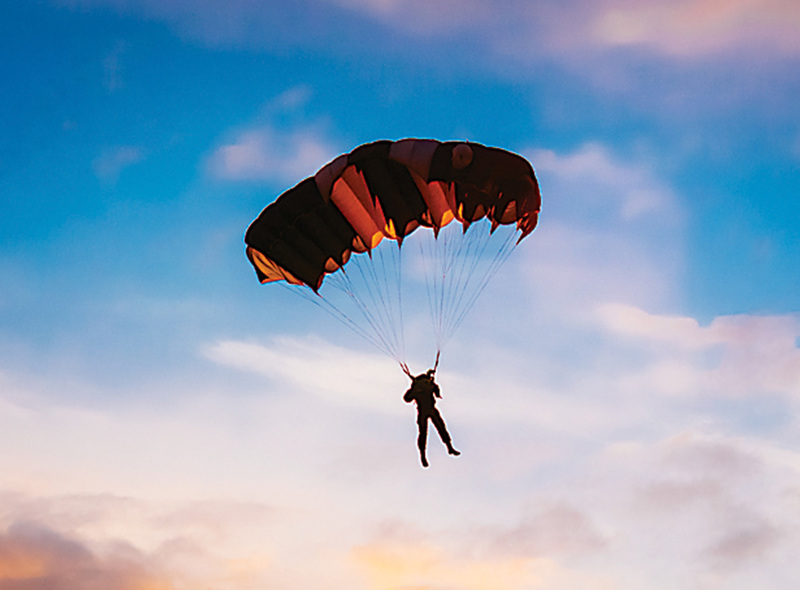 Closer to Home: Experience a 120-mph freefall from a passenger’s perspective when you tandem skydive from 10,000-plus feet with Skydive Baltimore’s experienced instructors in Churchville. Pennsylvania’s woods don’t come any deeper, darker, or older than Forest Cathedral Natural Area in Cook Forest State Park in Cooksburg, a National Natural Landmark. Don hiking boots to commune with centuries-old white pines called “The Ancients.” The Longfellow Trail leads to the most revered relic of all, the 181-foot-tall Longfellow Pine, and its equally venerable cousins. 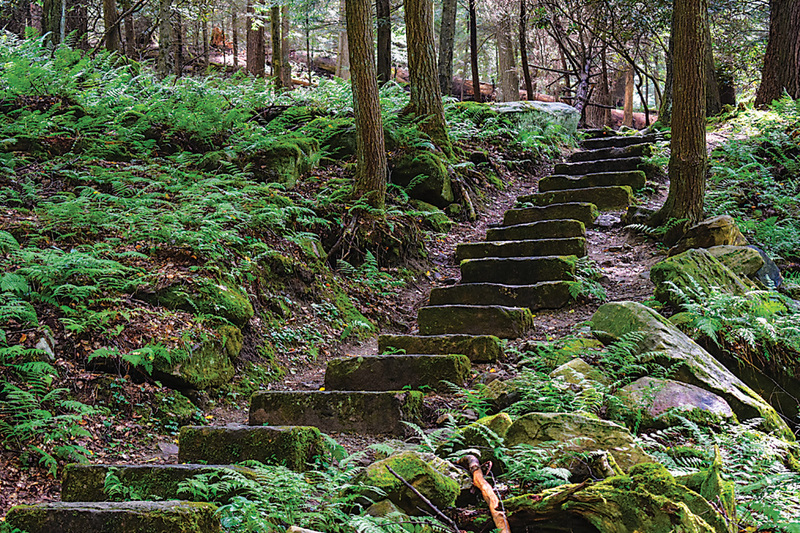 The Seneca Trail ascends through a grove of old-growth hemlocks. At the summit, climb the historic fire tower and see the forest from above the trees. Stay: After a day in the woods, where else to spend the night than a grand lodge with fieldstone fireplaces, chinked log walls, antler chandeliers, and . . . an Aveda spa? Yes, please. Gateway Lodge in Cooksburg provides all these things and more in its tastefully rustic rooms, suites, and cabins. Savor: Splurge on Gateway Lodge Restaurant’s five-course Taste of the Wilds menu, saving space for a slice of house pecan pie with local maple syrup. Beer-lovers trek to the family-owned Straub Brewery an hour away in St. Marys for award-winning suds from the “Eternal Tap” that has poured since 1872. Closer to Home: Maryland has big, old trees, too. See champion-sized specimens of tulip poplar and beech at Susquehanna State Park in Havre de Grace. Come fall, Pennsylvania’s Brandywine Valley positively glows, and in few places brighter than the region’s du Pont estates. The autumn flora starts to color in October at Longwood Gardens in Kennett Square, entrepreneur Pierre du Pont’s splashy, formal oasis. Don’t miss the Chrysanthemum Festival (October 25–November 18), when bazillions of bonsai-styled mums form a floral, Seussian landscape. In nearby Winterthur, Delaware, wander horticulturist Henry Francis du Pont’s more naturally landscaped Winterthur Museum, Garden & Library and behold billowy viburnums, brilliant beautyberries, and delicate white wood asters. Stay: Relax like aristocracy at The Inn at Montchanin Village in Montchanin, Delaware, a jewel of preserved du Pont history. The restored 19th-century workers’ community now encompasses 11 luxury lodgings that pamper guests with four-poster beds, fine linens, marble baths, and, you guessed it, gorgeous gardens. Savor: Where Montchanin’s village blacksmith once toiled, you’ll find Krazy Kat’s, the inn’s fine-dining, feline-decorated restaurant. Try game dishes (grilled elk) and farm fare (mushroom Vichyssoise). Also sample the culinary flavor of the local Latino community at La Pena Mexicana in Kennett Square, where the tortilla chips are bottomless, and the tacos and enchiladas are spiced just right. Closer to Home: Turning leaves, ripening berries, and blooming fall flowers offer eye-popping contrasts to Ladew Topiary Gardens in Monkton. Wild factor: Watch catapult teams sling giant gourds hundreds of feet into Sayers Lake at this annual local fire company benefit. Mild factor: The kids get to paint pumpkins, pet the resident snakes, and reconnect with nature at the center’s celebration of fall. 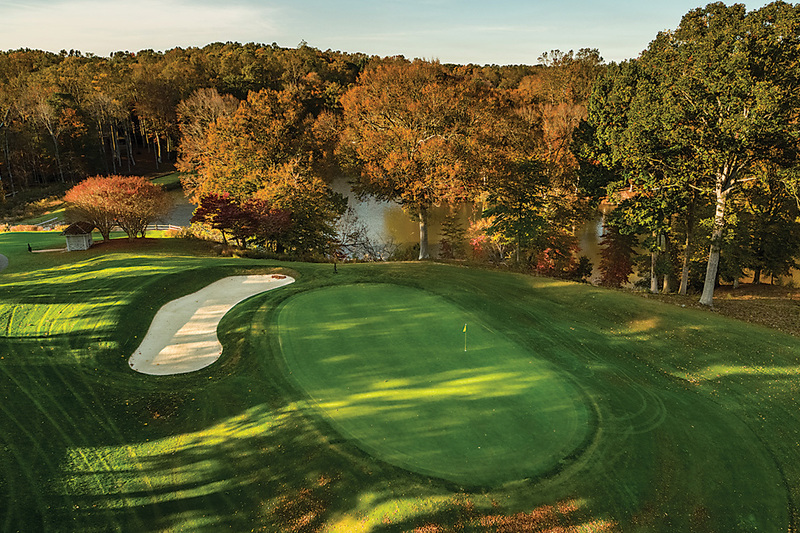 You could spend a fortnight playing a course a day in golf-blessed Williamsburg, Virginia. Where to take tee? Start with the championship links at Golden Horseshoe Golf Club and the Kingsmill Golf Club. Reopened last year, the Rees Jones-renovated Gold Course at the former updates the timeless woodlands fairway designed by his father, the lauded Robert Trent Jones. Created and later renovated by golf guru Pete Dye, the scenic River Course of the latter has hosted numerous PGA and LPGA tournaments. Stay: Book a Gold Golf Package at the Williamsburg Lodge, a stately Colonial Williamsburg hotel, and get a spacious room plus a free Gold Course round per night. Meanwhile, the swanky Kingsmill Resort’s Signature Golf Package covers your guestroom, greens fees, and breakfast. Savor: Dine like a tycoon on fresh oysters and steak with Yorkshire pudding at The Williamsburg Inn’s Rockefeller Room, followed by a petit Pecan Financier cake with bourbon chantilly cream. Local landmark The Cheese Shop also crafts four-star sandwiches to carry along with your clubs. Closer to Home: Play on another Pete Dye design, the Bulle Rock Golf Course in Havre de Grace, host of past LPGA tourneys. When summer ends, the beach-and-boating crowd deserts Deep Creek Lake, Maryland’s largest, most popular body of fresh water, located in Garrett County. But the fish remain: smallmouth bass, walleye, yellow perch, pike, panfish, and others. Launch a skiff at the boat ramp or throw your line from the extensive shoreline of Deep Creek Lake State Park. 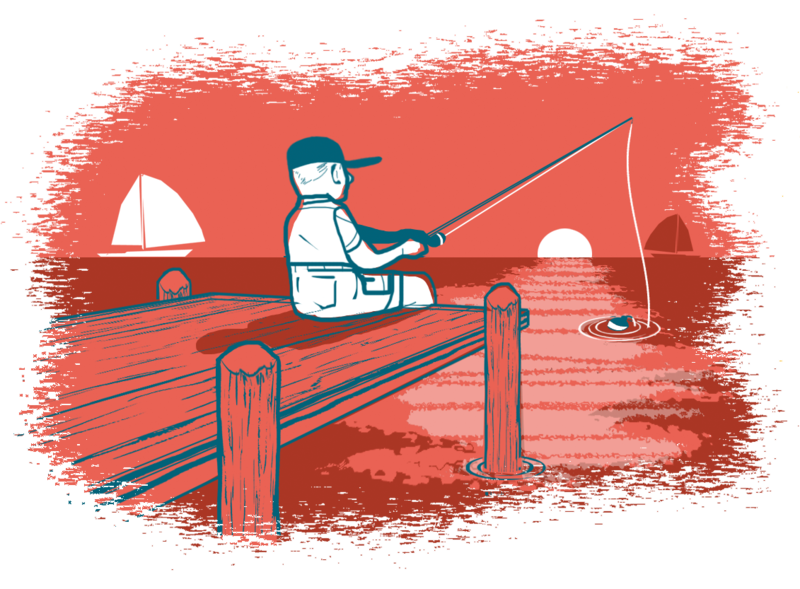 You can also fish at the Route 219 bridge pilings, rent a boat from a marina, or hire a guide. Bill’s Outdoor Center in Oakland is a one-stop shop with guided trips, tips, and tackle. Just be sure to check if you need to purchase a state fishing license before you go. Stay: The fish are a stone’s throw away when you sleep at LakeStar Lodge in nearby McHenry, with cozy lakefront rooms, kayak and boat slip rentals, a fire pit for toasting marshmallows, and pet-friendly policies. Savor: Surf, turf, vegan, sweets—whatever you’re craving, the kitchen at MoonShadow in McHenry has you covered with an eclectic menu and décor, plus live music. Join locals for great java and breakfast goodies at Trader’s Coffee House in Oakland. 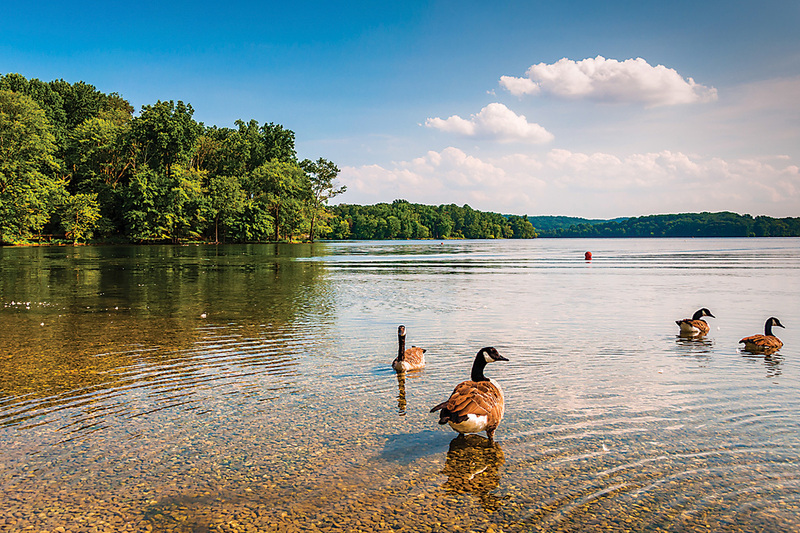 Closer to Home: Scottish lochs famously hold salmon, but the Loch Raven Reservoir boasts state-record white perch, as well as small and largemouth bass and catfish. The Loch Raven Fishing Center in Phoenix covers anglers’ every need. 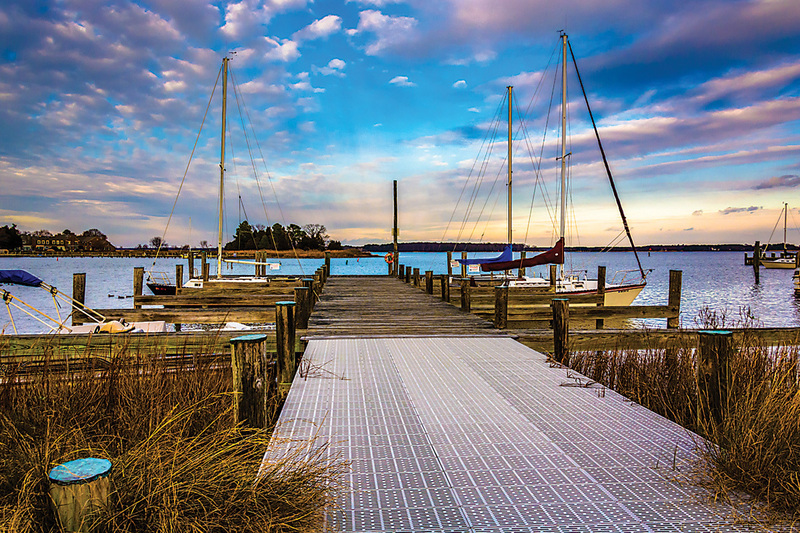 On Maryland’s Eastern Shore, St. Michaels and Tilghman Island showcase the maritime heritage of both the Chesapeake Bay’s leisure and working classes. For the former, imagine you’re F. Scott and Zelda Fitzgerald aboard Selina II, a 1926 luxury yacht that plies the historic harbor of St. Michaels, home to iconic sailing regattas. Aboard the 1886 Rebecca T. Ruark, raconteur Captain Wade Murphy shares tales of Tilghman’s hard-toiling watermen and estuary ecology during two-hour sails on the Bay’s oldest working skipjack. Stay: The new, buzzworthy Wylder Hotel continues the island’s slow gentrification, replacing the Harrison family’s iconic Chesapeake House seafood outpost. Kick back and enjoy the refurbished waterfront bungalows, saltwater pool, and beach-house vibe. Savor: The Wylder boasts two dining options: Tickler’s, a chic crab shack at the edge of the Choptank River, and Bar Mumbo, a nautically themed pub run by a D.C. fine-dining veteran with foodie tweaks on Shore classics such as crab cakes, fried oysters, and rockfish. Closer to Home: Brush up on local history with an educational sail on the tall ship Summer Wind off of Key Highway. Commemorate a special occasion or surprise your beloved with an excursion aboard aeronautics’ most colorful and carefree conveyance—the hot-air balloon. 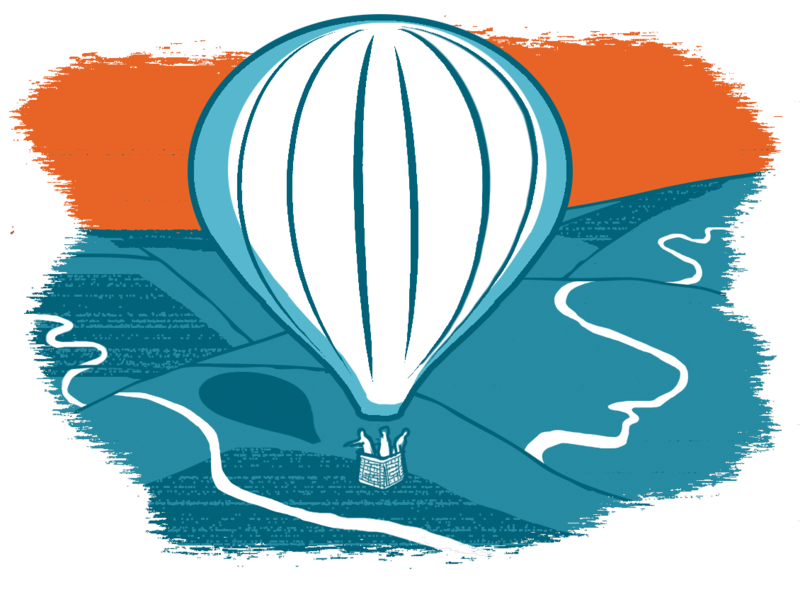 Travel peacefully at the wind’s whim as Delmarva Balloon Rides pilots you on a morning or afternoon journey above the Eastern Shore’s panoramic farm fields, pine forests, and waterfowl refuges. Perks include a lesson in ballooning history, the chance to help with flight prep, and the traditional Champagne toast to celebrate your return to terra firma. Stay: The French introduced hot-air ballooning (and, arguably, the art of romance), so where better to enjoy a couple’s getaway than the French Suite at The Inn at 202 Dover in Easton, one of five luxurious guestrooms at the historic downtown inn? Savor: Make it a sans souci weekend as you linger over house-roasted coffee and fresh pastries at Easton’s own Rise Up Coffee Roasters. For dinner, reserve a table at splurge-worthy Bas Rouge, located just up the street, where multi-course prix fixe dinners exude European-style fine dining. Afterward, swing by The Stewart, its fancy sister Scotch bar. Closer to Home: Try leaf peeping from above the rolling hills of Carroll, Howard, and Frederick counties. Friendship Hot Air Balloon Company in West Friendship offers regular and special scenic flights.